This off-season is dragging. It's only mid-February. Let's talk football! 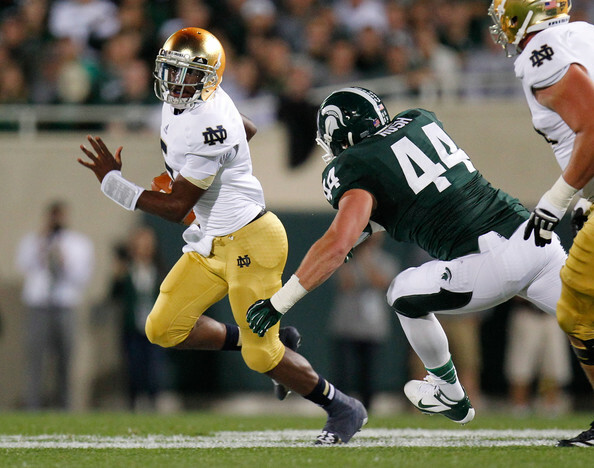 September in the B1G: Notre Dame and a bunch of directional schools. Image Source. In a effort to at least appear to care about what the rest of the league is doing this season, we present you the biggest games of each week of 2013...other than the one Michigan is playing in. Believe it or not, there are other games that go on each week that actually have a pretty big impact on the conference as a whole other than the one the Maize & Blue are in. This post will address which of those games will be the most important. Plus it's just fun to look ahead, too. To keep it brief, we'll break this up into a 3-part series. This post will look at the months of August and September. The first 4 weeks of the season are traditionally non-conference games for most of the league. This year's first league game is September 21st with Purdue @ Wisconsin. Week 1 is a snoozer for the Big Ten. It just is. There's no Michigan-Alabama (thankfully) and plenty of directional mid-majors to go around. My pick for the game of the week is actually split. I like UNLV at Minnesota on the Thursday night (8/29) leading into the weekend, and also Syracuse at Penn State at Met Life Stadium in East Rutherford, NJ. The Gophers are coming off a 6-7 season which was a small but measurable improvement from a 3-9 2011. I mean they did make it to a bowl game, which is more than Ohio State can say...amiright?! ZING! Head coach Jerry Kill needs big wins, especially in the early non-conference schedule if he hopes to continue an upward trend. Last year's season opener against UNLV at Sam Boyd Stadium was a 3-overtime 30-27 victory for the Gophers which helped lead them to a 4-0 record to start the season. Well, since it's a neutral venue, I suppose that's interesting. Syracuse is hardly the best gauge for where Penn State is at, but given who the rest of the Big Ten is playing, this game is suddenly interesting. I'm curious to see the next step for Bill O'Brien and Penn State after a surprisingly resilient 8-4 season in 2012. Lame duck Penn State could play spoiler for Ohio State or Wisconsin in the Leaders division, and a hot start to the season will help them achieve that. Obviously Notre Dame at Michigan in primetime gets top billing this week. But a nice part of playing at night is you get to catch the noon and afternoon games unimpeded. And one of them stands out to me. For as bad as Ohio State's non-conference schedule looks on paper, I think this game could be a good one. The Buckeyes could be looking ahead to the road trip to Cal in week 3, and San Diego State is no slouch. Brady Hoke's former squad played Michigan tough in 2011, and they also notched big wins against #14 Boise State and Air Force in November last year. Ohio State can be a little slow out of the gate in early-season games. Maybe, just maybe the Aztecs can give them a game. It's the return trip to Lincoln from last year's game in Pasadena in week 2. UCLA won that game 36-30 in a back and forth primetime (EST) battle. The 2013 contest could also be a primetime game, and it would surely be a good one to tune into. Big Ten teams rarely travel well out west, so it's always nice to have a Pac-12 team in your house for a change. If only it were November and about 35 degrees. Sparty is Notre Dame's 3rd Big Ten opponent in as many weeks, but the first one at home. This will be the first really tough test for Sparty in 2013. We'll see how much they miss RB Le'Veon Bell, TE Dion Sims and the big names from the 2012 defense that left for the NFL. They'll be coming off a relatively light-weight three week slate of Western Michigan, USF and Youngstown State. So how Michigan State performs in South Bend should be a good indicator for the rest of the season. The Irish always have a way of exposing your biggest weaknesses. Outside of Michigan on November 2nd, this is Sparty's biggest test. Half of the Big Ten is off this week, so pickin's are a little slim. But that's okay, because the biggest game in the Leaders division all year takes place right out of the gate. Immediately, the winner of this game has a huge leg up on the division race. We're not exactly sure what Wisconsin is going to look like in 2013 sans Bielema. But we are pretty sure what Ohio State is going to look like, and from what I can tell, this is probably the biggest hurdle they'll have on their way to Indy. Oh, don't get me wrong...we're all Badgers on this day, but it's going to take their best shot to knock off the Urban Express. Up next, we'll take a look at the always exciting October slate of league games.